Thinking about the possibility of some cat wall shelves, but feeling unsure about how and where to place components on your walls? 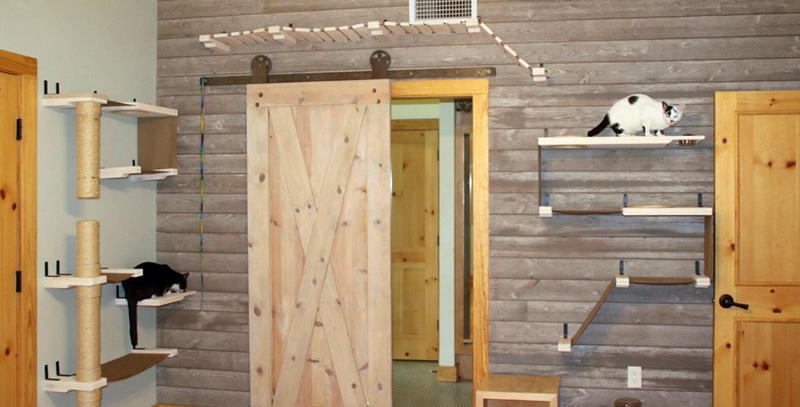 In this article, we’ll share some tips to help you design a great wall playground for your cat. When considering options, it’s important to keep in mind your cat’s agility level. Is your cat young and highly active, or, is he or she a senior citizen who may not be able to leap and stretch? Or perhaps you have multiple cats with different agility levels. Your design goal is to create a “pathway” with shelves that your cats can easily navigate to get up high. It can be a simple pathway, or a longer, higher trek, but, your design must insure that each step or shelf can be reached comfortably from another point in the pathway, to allow for seamless navigation. So, having a good sense of how far your cat can realistically jump or stretch is important to this thought process. As you design your pathway, think about the starting and ending points. One approach is to place one component low enough that it can be reached from the floor. Alternatively, furniture can serve as launching points; perhaps the back of your couch can allow for easy access to the lower level of your system. And of course the ultimate solution is to integrate floor-based cat trees and towers as start and end points in your design! If you have multiple cats that sometimes fight or chase each other, be sure that you don’t create a ‘trap’ point, where one cat can get cornered by another cat without a means to escape. 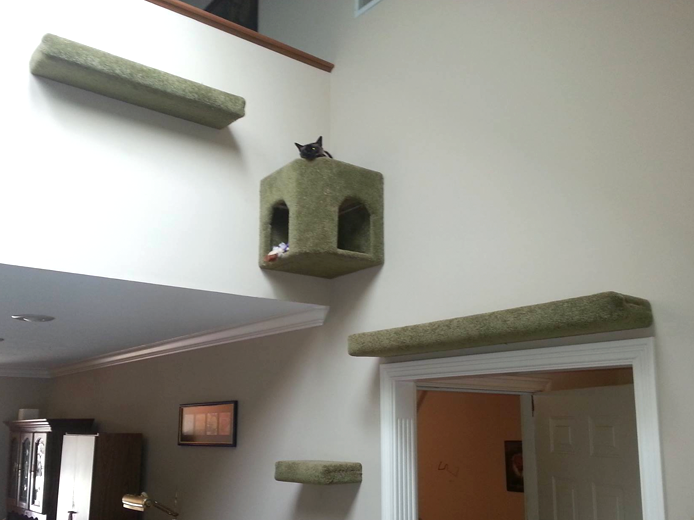 Adding a cat wall system is a great technique to create a comforting space of their own for cats who may feel threatened or insecure, but it will be counter-productive if each shelf in the system doesn’t allow for an alternative exit route. This might seem obvious, but, while the goal is to get your cats up high so that they can oversee their kingdom, be sure and leave sufficient space between your highest shelves and the ceiling, so that your cats have room to stand up comfortably! Pad that space a bit more, keeping in mind that if your cat is jumping up to the highest shelf from below, they’ll need extra height to allow for the upward arc of their jump. Don’t feel that you need to limit your placements to flat walls. We have components that are made to fit into corners, allowing you to easily extend your cat wall pathway onto multiple walls in your room. Also, don’t forget that shelves can span the tops of windows and doorways! We suggest that each component in your system is mounted to at least one wall stud for optimum stability. Most homes today have studs spaced 16 inches apart; you can use a stud finder to identify the studs in your wall and consider this in your design. While we do recommend hitting at least one stud for each installed shelf, heavy duty wall anchors can be used as an alternative, and are supplied with most of our components. Visit our customer photo gallery to view a wide variety of great cat wall system installations for design inspiration. For more information regarding the technical aspects of installation, see our article on installing your cat wall system. If you need further guidance, don’t hesitate to contact us.